Hello once again fellow bloggers & scrappers! Today's post is a tutorial on how to make these really cute two-tone ruffled flowers. First of all I'd like to give a big thank you to Anna Fearer who inspired me to take a new look at the many punches & dies I have collecting dust in my stash. Anna has a gorgeous Etsy shop full of beautiful handmade flowers. She also has a very inspiring blog where she shares all her lovely creations plus a couple of tutorials on how she goes about making a few of her flowers. It was after watching one of these tutorials that I was motivated to try my own little creation & this was the result. Make sure you visit Anna's Etsy shop More Paper Than Shoes & her blog for lots of handmade flower inspiration. So for these particular flowers I ended up using the Flower Layers Die by Sizzix--a die that I've had in my stash for years and never really used. Step 1: I've used a total of 6 layers for my flower. I used the second from the largest sized flower. 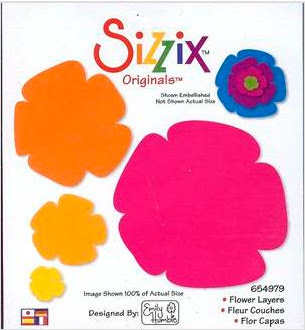 You can make solid colored flowers, two-tone flowers (my fave) or even a cascade colored flower! This one will be a cascade flower. Step 2: Take 3 of the 6 layers that you plan on using for the bottom part of the flower and snip about 1" in between each petal. Step 3: Take each petal & with your fingers fold them in half. They don't have to be perfect. Step 4: With a pair of round long nose pliars--take the corner of each petal & curl them down. If you don't have long nose pliars, a thin skewer, a skinny neck stylus or even a thin paint brush handle can be used to curl the petals. Step 5: This is what the edges of your petals should look like once you bend them in the middle & curl the edges down. I like to think that the petals look like an arch or a very wide letter 'V'. Step 6: On a foam pad or even a mouse pad--anything soft--shape your layers by cupping them with a stylus or any round object. Step 7: With strong adhesive (I personally use hot glue) adhere your three bottom petals. Try to alternate your petals. This is what your three bottom layers should look like when done. Step 8: Now shape the 3 top layers in the same manner you shaped the bottom 3 layers. Only difference is to cut into each petal a little bit deeper than you did with the bottom layers without going all the way to the center. Take the layer that will be your top most layer. Punch a hole in the center big enough to tuck a few folded stamens. Then cup the petal around the stamens as shown. Add a bit of glue around the petals in order to keep the petals 'hugging' the stamens. This will be the center of your flower. Step 9: Here's what your top 3 layers should look like. Step 10: Start shaping your top layers now in order to adhere them. Cup them as shown, add glue to their bottoms & adhere them to your bottom layers. Again try to alternate those petals. Finish it up by adhering the center layer. Step 11: Here's your finished flower! Once complete, shape your flower a bit more with your round nose shaped pliars. When adhering the layers, the petals my lose their curl a bit...so at this point you can re-add a bit of curl to each petal. Here's an example of a solid ruffled flower. You can see a couple of more two-tone flowers in the background. Take note that these flowers have a lot of volume to them--meaning they stand pretty tall. So they're not meant for your traditional scrapbook pages that go into albums. Hope you found this tutorial of some help & that you take a look at your punches & dies in a whole new way. Can't tell you how happy I am that I now found a very good use for that old Sizzix die I had in my stash with literally an inch of dust on it! Have a great rest of the week!